It’s been a while since I shared one of my translations of the letters from my great-great grandfather to my great-grandfather. (The first three are posted here, here, and here, and here.) This one is the most dramatic of them all. I’ll give it to you in two parts, but this section is the meat of it. Five years have passed since the last preserved letter, and John has moved from Illinois to Iowa. I received your very welcome letter this afternoon, and re-read it with tears, and I want to answer it right away if I get the strength from the Lord to manage a letter to you at this time. I saw and heard from your letter to me that all was well with you when you wrote to me, which was precious to me to hear from you. Ja, dear son and daughter and children, I have another piece of news to tell you today, and that is that the Lord has called your mother from me to Himself; and now, God help me, I am left here forsaken and alone as a wild bird, and have no one to cling to. Ja, God must now be my comforter and helper both now and preferably forever. Ja, she died during the morning, at 7:00, of April 3. Ja, she had been very sickly all winter, but has managed to be up [and about] nearly every day, and working too. She didn’t give up; there was some work she would have wanted to finish, and she almost accomplished it, too. Also I can tell you that she had a stroke 3 weeks earlier on her right side, so that she lost her power of speech, and could not talk to us, other than yes and no, so that we could understand what she said. But God be thanked that He did not take her mind from her at the same time. No, she kept that until Wednesday morning at 6:00, when she had a stroke on the left-hand side, and then the Lord took everything from her, both hearing and sight, and [she] could not move a limb of her body from Wednesday morning until Saturday morning at 7:00. Oh, how she had to struggle before she forsook these “huts in the wilderness.” Oh, but you can believe me when I tell you that we had hard hours waiting with her and seeing how she suffered before she passed away. Ja, I was there alone with her when she suffered her last stroke; ja, you can easily understand how it was for my poor self, ja, I called to her and lifted her in the bed, but nothing did any good for this poor creature who stood there all alone. Ja, ja, what can we say? We must certainly accept everything in this world, and even though it isn’t always to our taste, we must endure it anyway. Marta was with Mother a good 14 days after she had her first stroke, but then she had to go home again, and was not here when she had the second. Berta has been very sick, and has been in bed for some time now, but now she is up and has been here now when Mother died. I sent them a message when Mother had the second stroke, and then both Berta and Marta came. Ja, “there was a house” when they saw Mother is such as a condition as she was in. Marta had to go home to her own house now when Mother died, but her husband has been here and been very helpful with Mother at the last. Ja, he is very kind in every way to all of us. Mother did not get to hear your last letter to us, Jan. Jan H., how heavily you lay on her heart; oh how she longed to see and talk to you again, but it was not possible; for you know that you were the dearest of all to her. And when [if] you could only see all the salt tears she has shed because because you did not keep your promise to her and come home so she could see you again; but now that is all over. Now all her crying for you children is at an end. Ja, she was a loving and tender mother to all you children, for nothing else can be said by any of you. Ja, she wept and sobbed so many days and nights with all of you. Ja, now all that is over with her, she has gone home to her Savior. Ja, now she and Helvig are together, we may hope. 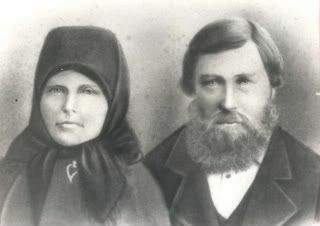 Ja, it’s remarkable—Helvig last Easter and Mother this Easter. Ja, and another Easter I could also be gone from Kvalevaag and home. Ja, God knows and not I, for I know well that I have my warning, for I am now so sick in my chest every day that it is serious. Ja, now God’s will be done. Ja, now we have laid her out in the bed in the south room, and there she lies now looking like a bride to me. We have not yet decided what day we will bury her, but it will probably be next Saturday—I guess that’s the 10th of April. Ja, now at Easter your mother would have reached her 69th year, and now on the 2nd of June it would have been 40 years since we came together. Ja, thanks be to the Lord for everything, both for evil and good days we were together; ja, the Lord gave and the Lord took away, ja, blessed be the name of the Lord. I would have preferred to keep her longer, but that was not the Lord’s will for me now. When it pleased Him to call her home to Himself, ja, then I had to give her up to Him who has the power in His hand to take when He wills. It is my dearest wish and prayer to the Lord that I might find her again yonder, someday when my days are also told, never to be parted again [over] there. Ja, grant and bestow this on us, O God, for Jesus Christ’s sake, through Your gentle grace. Amen, in Jesus’ name, amen. I appreciate getting to read these letters Lars; as I don’t have anything similar from my own relations. – I’m interested in what kind of education this man had; as there’s an eloquence and dignity in his writing that appeals to me. Norwegian peasants of this period had a basic education in reading, arithmetic and religion. Norwegian pietists were usually avid readers, though. Your ancestor was a person of courage and dignity. May we all face our trials with such faith and strength.